Plaque is a matrix of bacteria and protein that is produced continuously. It makes the slimy layer on your teeth that you feel. Plaque hardens to calculus (tartar) within 48 hours. 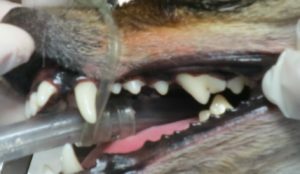 Tartar traps bacteria at the gum line, which leads to gingivitis (gum inflammation). Gingivitis is an early sign of periodontal disease and will progress to gum recession, bone recession, and tooth loss without regular cleanings. Dental disease can cause many signs of oral (mouth) disease and includes bad breath and pain which leads to difficulty eating hard foods or chew toys, loss of appetite, and possibly weight loss. However, many animals are stoic and do not show overt signs of a painful mouth. 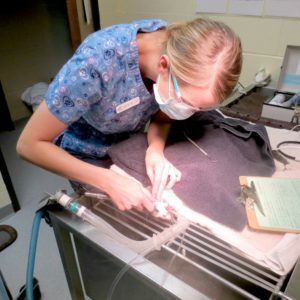 But after dental prophylaxis (cleaning), many owners report their animals are more energetic and eat better. Dental disease also leads to systemic disease as bacteria from the mouth enters the bloodstream via inflamed or infected gingiva and seed into the heart and kidneys leading to disease of these organs. Treatment of dental disease includes a thorough dental prophylaxis under anesthesia. 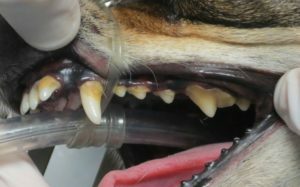 Anesthesia is used to keep animals still so we can get the tartar from under the gumline and off all the surfaces of the teeth. Do you think your animal could open its mouth and say “aaah”? To keep the mouth free of plaque, preventative methods such as toothbrushing, dental sprays, dental chews or treats may be used. Every day you should try some type of plaque control in order to reduce tartar build-up. Does your pet have bad breath? Make an appointment to see if they need a dental cleaning!